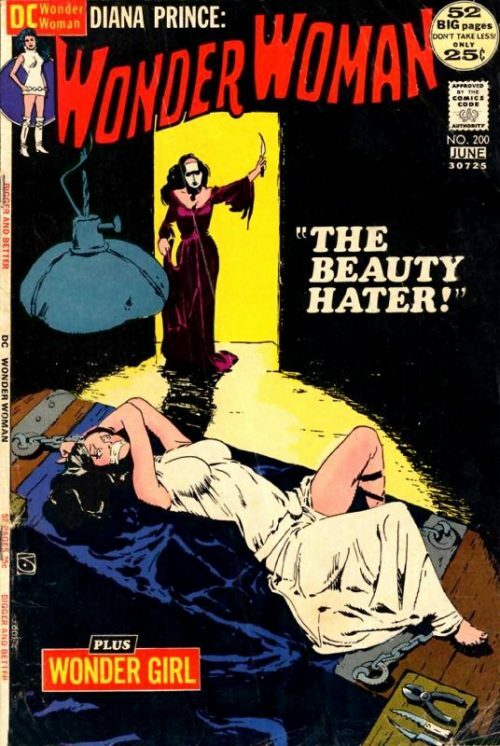 This issue also features Wonder Girl. The cover image however is extremely misleading! 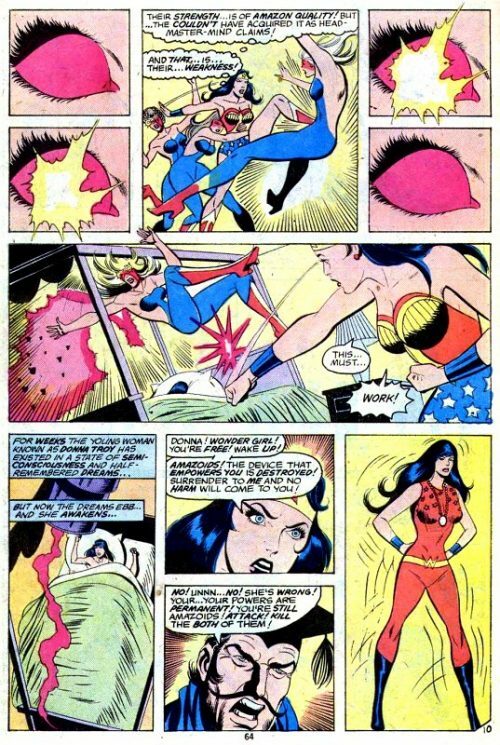 There is no fight between Wonder Woman and Wonder Girl and the two do not even confront each other in any way! 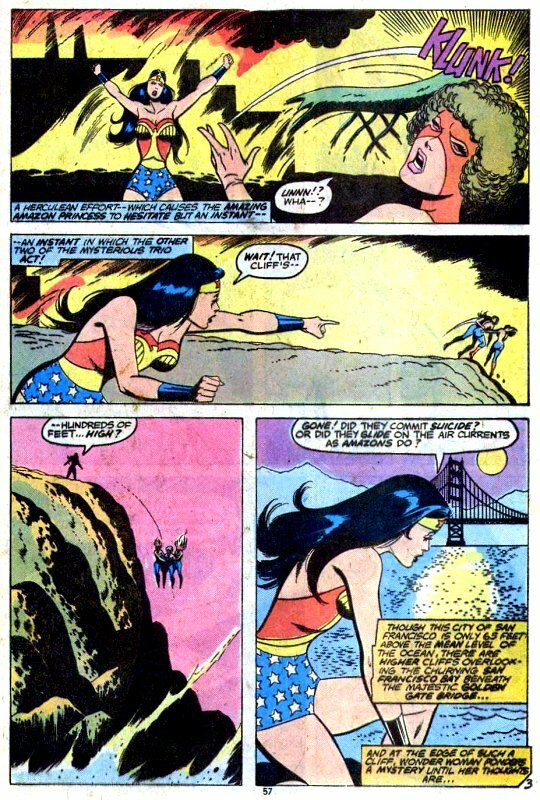 Wonder Woman is making a trip over the skies of San Francisco on her way to visit Donna Troy, otherwise known as Wonder Girl, when she notices a warehouse on fire. As she swoops down to investigate she sees three women in costumes escaping through the perimeter fence with a box each. A security guard orders them to stop or he will shoot. Wonder Woman advises them to heed his words but their lifeless eyes seem at first not to not even notice her before crackling with energy. She decides to take direct action and punches the lead female, sending her piling into her colleagues behind and sending them sprawling. The security guard, amazed at first the robbery being carried out by three beautiful women and then the arrival of the Amazon Princess herself, steps forward to give her a hand. But suddenly the woman she had hit leaps up and throws an unsuspecting Amazon into the perimeter fence before using her super strength to wrap the wire mesh around her. Wonder Woman is amazed that the woman has not only recovered so quickly from her blow but is using similar strength to try and trap her now. If she did not know any better she would swear they were Amazons! She immediately uses her own strength to burst free of the restraining mesh and a fragment of the metal fence post strikes the watching woman on the head. Her two colleagues waste no time in taking their dazed comrade and run towards the cliff edge, leaving behind the stolen packages. Wonder Woman shouts a warning to them that the Dr.op is over a hunDr.ed feet but they ignore her and jump into the raging surf below. Wonder Woman looks down but can see no sign of them, wondering whether they really did commit suicide or whether perhaps they glided to safety on the air currents like an Amazon would? Her thoughts are interrupted by the security guard and Mr. Webster, who is the Company’s Director. As the fire department tackle the blaze, she informs them that unfortunately her quarry had escaped. Webster tells her she has already done them a great service by recovering the stolen components. He is about to discuss the matter of a reward, as he knows she is one of ‘those New York Super People’ and as they all know, New Yorkers charge for everything! However, she has already departed and pilots her invisible plane towards Dr. Tammines’ School for Exceptional Girls, where Donna resides. As she flies, Wonder Woman thinks to herself that it seems more than a coincidence that renegade Amazons show up just as she is about to re contact Donna. 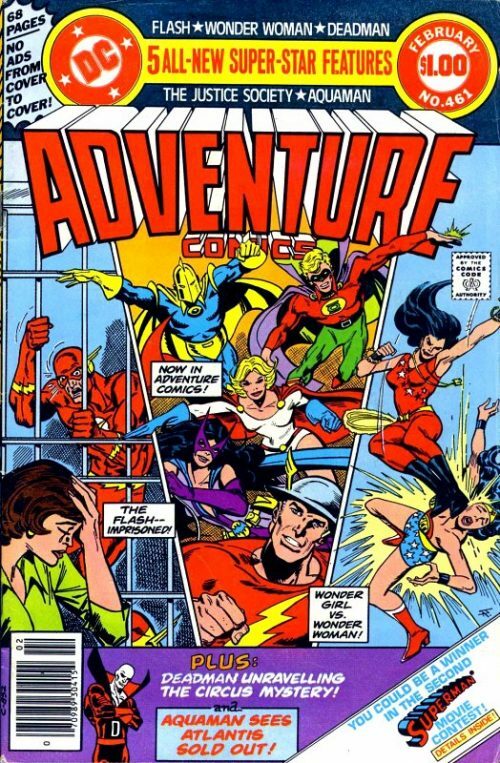 Perhaps Donna has a lead because Diana has heard nothing from Paradise Island about missing Amazons. Arriving at last, she leaps down from her plane and transforms into her Diana Prince civilian guise as she goes. As she makes her way to the front door she muses that she cannot blame Donna for wanting to ‘find herself’ and that she hopes this private school is what Donna has been looking for. She knocks on the door and as Donna opens it inquiringly, the two ‘sisters’ rush into each others arms and hug, smiling. Donna asks Diana what she is doing here as she had not advised her that she was coming to visit. A puzzled Diana informs her that she had written a letter but she had never received a reply. An equally bemused Donna replies that she has never received any mail and that she had assumed Diana had been too busy. They both agree that sisters should never lose touch! We are then treated to a flashback of how these ‘sisters’ came to be. Many years ago Wonder Woman had returned to Paradise Island having just rescued a child from a fire which claimed the rest of the family and all records about them. The orphan was adopted by the Amazons and through secret and strict training this seemingly normal American girl became Wonder Girl! Returning to her native country years later, the girl used her new talents for the cause of justice and joined a group of other stalwart youths known as the Teen Titans. 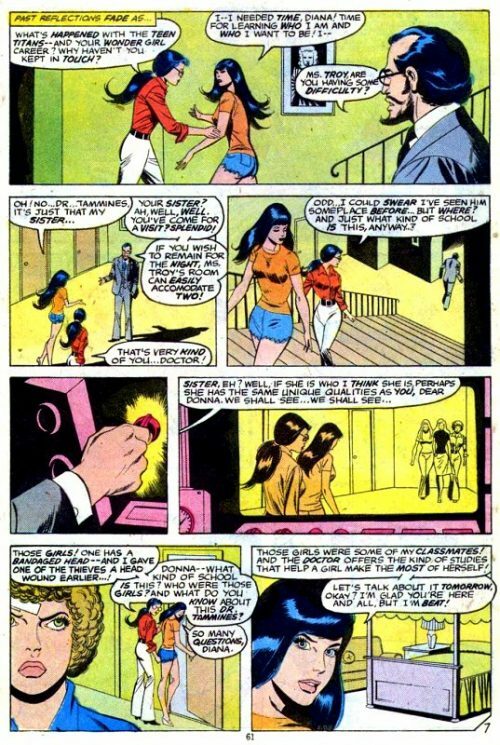 But Wonder Girl’s past was still a mystery and though her career as a fighter of crime gave her world wide fame, her identity of Donna Troy was false, created by Wonder Girl so she had a civilian life away from super deeds. Behind the heroics, she searched for the evidence of her family and for herself. When the Teen Titans broke up, Donna Troy headed west to California and the Dr. Tammines School for Exceptional Girls, for reasons unknown. 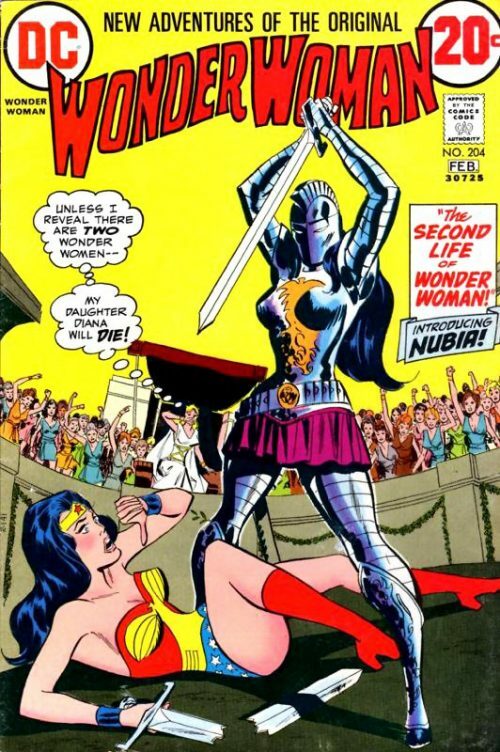 Now, as Diana and Donna hug, the Amazon Princess asks her younger ‘sister’ what had happened to the Teen Titans and her career as Wonder Girl? Donna tells her that she needed time to learn who she is and who she really wants to be. Just then Dr. Tammines appears and asks if everything is all right? Donna tells him that her sister has come to visit her and he welcomes Diana. He says that if she wishes to stay overnight she can use Donna’s room which can easily accommodate two. 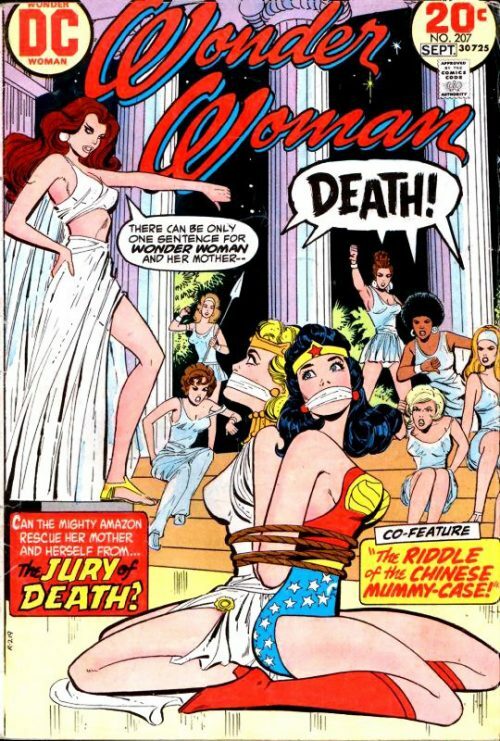 As Donna and Diana reach the room, some girls walk past and the Amazon Princess notices that one of them has a bandaged head. She remembers how she had given a head wound to one of the thieves earlier and asks Donna just exactly what kind of school this is and what does she know of this Dr. Tammines? Donna replies that the other girls are some of her classmates and the Doctor offers the kind of studies that help a girl make the most of herself. She suggests they talk some more tomorrow as she is glad to see her sister but she needs her sleep. 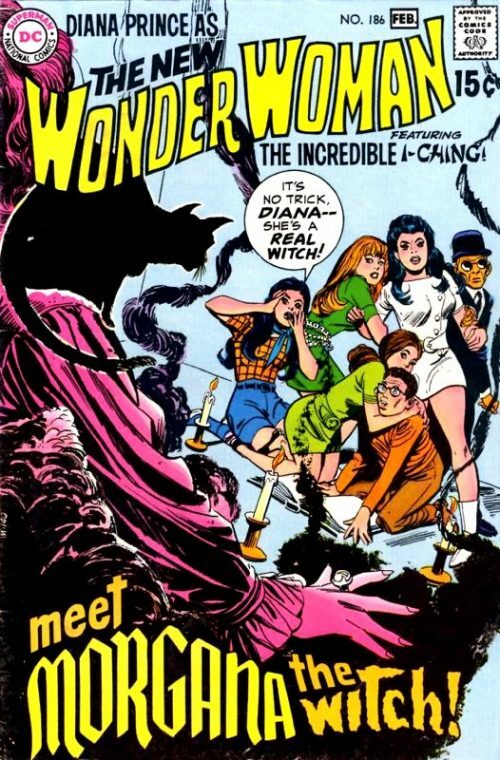 But a little later when Diana is sure Donna is in dreamland, she transforms into Wonder Woman. Diana ponders on how Donna’s whole attitude had changed when Tammines had appeared. And as for those classmates they seemed like zombies and definitely appeared to be the same girls from the warehouse robbery. Suddenly, Donna’s bed is infused in crackling energy and fearing for her life, Wonder Woman moves to get her out of the ‘death trap’ bed. But she hears a voice behind her and turns to see Tammines dressed in a headmaster’s outfit together with the three girls, now back in their own costumes. She recognises him as the villain known as Headmaster-Mind and suddenly realises that ‘Tammines’ is an anagram of Mastermind! He informs her that the girls are his Amazoids. 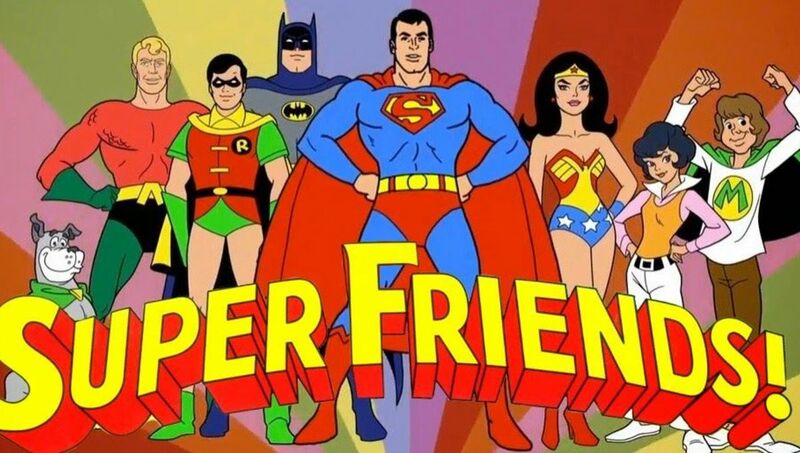 They are specially trained students who siphon off the powers embodied within the sedate Wonder Girl and he intends to use Wonder Woman’s powers to expand the capabilities of his army of Amazoids even more! He goes on to explain that for too long he has offered his talents for crime to others. But he had been defeated time and again by her and her compatriots in the Justice League. He turned to aiding himself by scrutinising the Teen Titan known as Wonder Girl closer than any human has observed another. After learning her other identity and her immediate goals he devised the school, offering her and certain select other young ladies, exactly what they were looking for. He enticed those young lovelies with the promise of power – Donna’s Amazonian power – and turned them into his army of Amazoids! He points to the bed surrounded by crackling energy and tells Wonder Woman that once she is placed under the device their power will increase for him to control – and she will be helpless! With that, the Amazoids attack her and as she takes their punches, her dilemma is that she does not wish to harm them as they are nothing but mindless zombies under his control. But if she does not defend herself they will overpower her! Just then something occurs to her. Although the Amazoids exert Amazon strength, they could not have physically acquired it as Headmaster-Mind claims. With that she tests her theory and punches one of her attackers, sending her crashing into the device above Donna’s bed, destroying it. For weeks, Donna has existed in a state of semi consciousness and half remembered dreams But now the dreams ebb and she awakens. Wonder Woman yells at her to wake up as she is now free! She also instructs the Amazoids to surrender as the device which empowered them has been destroyed. A furious Headmaster-Mind tries to tell them that she is wrong and that the Amazoids still have their powers. 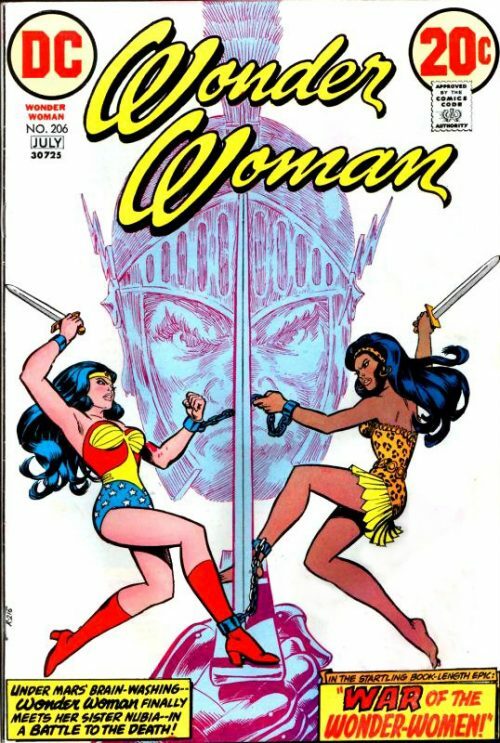 He orders them to attack both Wonder Woman and Wonder Girl, who has now transformed into her own costume. The Amazoids can feel themselves weakening but their master tells them to believe in their powers! They run towards the Amazon sisters demanding their power back and Wonder Woman and Wonder Girl gently knock them backwards, careful no to harm them. The three girls stagger back and knock Headmaster-Mind into the smouldering device, which explodes! As a fire breaks out, Wonder Woman and Wonder Girl carry the dazed young girls outside to safety. The sheepish girls asks what will become of them now as all they wanted was to be like her and Wonder Girl. The Amazon Princess replies that it is up to them. They were not responsible for their actions while under the Headmaster-Mind’s influence. What they did not realise was that his machine was a fake! Wonder Girl continues that any woman can have Amazonian powers – all they need is the will and years of secret and hard Amazonian training. Headmaster-Mind awoke that potential in each of them by convincing theatrics and the power of suggestion. Wonder Woman had convinced them just as completely that they were now powerless as their belief was in the machine. As the Amazon sisters depart for Wonder Woman’s plane, they yell down to the watching girls that if they believe in themselves they can all be Women of Wonder! As the robot plane makes its way through the night skies, Wonder Woman asks her adopted sister what lies in store for her now? She replies that there is a super heroine career ahead for Wonder Girl – and a continuing search for her true identity that will end sometime – somewhere!